Gilorma (Sam) Giancana was born in Chicago on 24th May, 1908. At the age of ten he was expelled from Reese Elementary School and was sent to St. Charles Reformatory. This did not have the desired effect and in 1921 joined the 42 Gang. Over the next few years he was arrested for a variety of different offences. In 1926 Giancana was arrested for murder. However, charges were dropped after the key witness was murdered. He was later sent to prison for theft and burglary. On his release he went to work for leading gangster Paul Ricca. By the 1950s Giancana was one of the leading crime bosses in Chicago. On 14th January, 1992, the New York Post claimed that Hoffa, Santos Trafficante and Carlos Marcello had all been involved in the assassination of President John F. Kennedy. 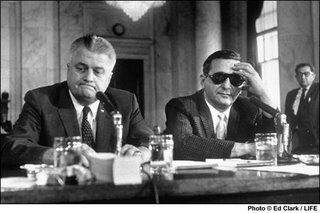 Frank Ragano was quoted as saying that at the beginning of 1963 Hoffa had told him to take a message to Trafficante and Marcello concerning a plan to kill Kennedy. When the meeting took place at the Royal Orleans Hotel, Ragano told the men: "You won't believe what Hoffa wants me to tell you. Jimmy wants you to kill the president." He reported that both men gave the impression that they intended to carry out this order. In 1992 Giancana's nephew published Double Cross: The Story of the Man Who Controlled America. The book attempted to establish that Giancana had rigged the 1960 Presidential election vote in Cook County on John Kennedy's behalf, which effectively gave Kennedy the election. It is argued that Kennedy reneged on the deal and therefore Giancana had him killed. In his autobiography, Mob Lawyer (1994) (co-written with journalist Selwyn Raab) Frank Ragano added that in July, 1963, he was once again sent to New Orleans by Hoffa to meet Santos Trafficante and Carlos Marcello concerning plans to kill President John F. Kennedy. When Kennedy was killed Hoffa apparently said to Ragano: "I told you could do it. I'll never forget what Carlos and Santos did for me." He added: "This means Bobby is out as Attorney General". Marcello later told Ragano: "When you see Jimmy (Hoffa), you tell him he owes me and he owes me big." 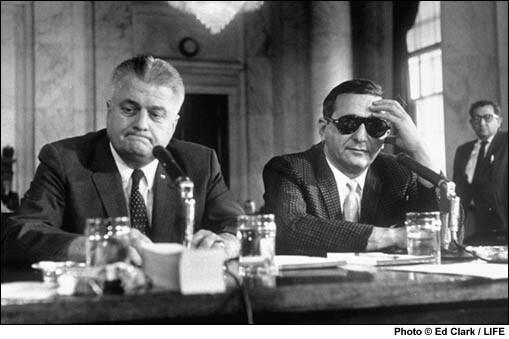 Mafia crime boss Sam Giancana (right) and an unidentified man appear before a Senate Labor Rackets Committee hearing, at which he refused to testify, invoking the 5th Amendment. 1959. Interesting blog on outlaws you have here. Just Blogspotting this evening and stopped in to say hi. Hey, this is weird but there was a criminal in New York just after the civil war who was a hump back that met with his gang in a graveyard. Something to look for. Wow! This is revealing...There are so many smoke screens erected over the years regarding this sad chapter of the contemporary American history. I am afraid that as more time goes by, we will no longer be able to tell what is truth or lie. Coming from an Italian family I heard many stories about various "wise guys" when growing up. It's interesting to see someone post more history about them. Great reference materials on organized crime. I just finished a book called "Deep Politics" and was lost in a sea of names. The Sam Giancana post was especially helpful here. Thanks! This is a very interesting blog, you should keep going with it! Looks like you haven't posted anything since last summer.